Today turned out to be a nicer day than I expected; sunny, warm and slightly windy. The morning started out cold, but made its way up to 72 degrees by the afternoon. My mother-in-law, Carol, came up early to entertain Ava for the afternoon. Once I got dinner started (potato soup), I grabbed up my gear and hurried down to go see the bees. Although I observe them from outside the hive often, the August heat and humidity prevented me from donning the full bee suit and going down to take a peek. My wasp sting scare set me back a little also. It took two more stings–bee and wasp–for me to discover that with enough Benadryl (about 4 doses of the liquid version), I can be sure that I won’t have a crazy allergic reaction. Prior to that I had just put on another super, experimenting with top bars. I found out later that the bars I used were too narrow and even with waxed guide strips they would not likely make nice comb. I expected that they would just go ahead and make freeform natural comb and I wasn’t too worried about that since I had a queen excluder on. I figured I could still harvest it, even if it were a mess. A completely empty super! Peeking down between the (horribly inadequate) top bars I saw nothing–nada–they didn’t do anything upstairs. All that time, wasted. The brown screen you see is the queen excluder. It keeps the queen from moving up and laying eggs in the honey super. Like I said, I was prepared to deal with freeform comb. I figured they’d just draw comb diagonally here and there, like they did with the lid when I had the mess to fix earlier this spring. Ah well, I guess I am learning. At least they are still alive, haven’t flown off and appear to be completely healthy! I’ll do things differently next year. The inner cover was nice and clean. No ants this time! My husband has come with me all the other times I have worked the bees. Today, with the day length getting shorter, I couldn’t wait for him to come home and I worked them by myself. It was actually much more relaxing for me not to have to talk through it. I just took my time and enjoyed their buzzing company. No pressure. I worked off all the burr comb that I could see on the upper deep, pulled out a couple of frames to inspect and put everything back together. I’m going to leave that empty super on there just like it is. I will use it to accommodate a Ziploc bag sugar-water feeder with some terramycin in it when I go back to look at them next week. I’ve got buckwheat sown in most of my garden plot right now and with all the rain we’ve had, I expect it will germinate soon. This is the first time I’ve planted buckwheat for a cover crop, but what I’ve read on it says that it should be in bloom 3 weeks after it emerges. It’s a favorite food source for bees and will make for nice fall forage for them. 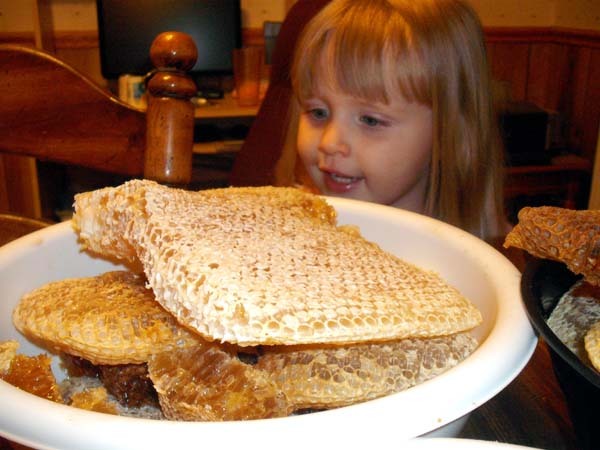 I hope that with feeding them and adding on another super, maybe they’ll put up some buckwheat honey. I will probably just leave it on there for winter, just to be sure they don’t starve out; although what they have now should be enough. It’s the same set up I wintered them on last year. After my husband got home and we all had dinner, I left myself very little time to go out and look for mushrooms today. I got about a half hour to walk the tractor path back into the woods on my Dad’s farm. I didn’t find any mushrooms, but I didn’t go home empty-handed. 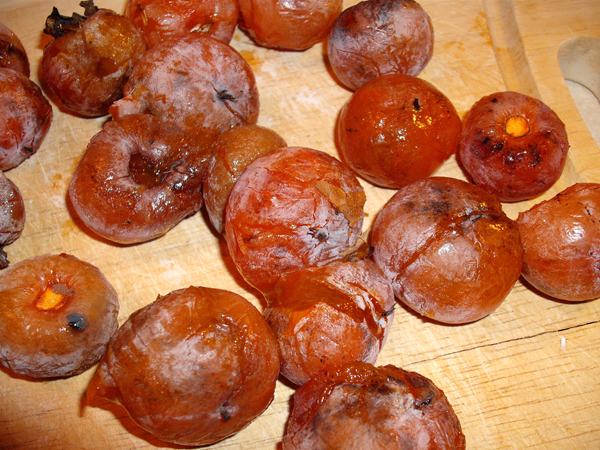 I found some big persimmons. Ava liked them and said they were like jelly. They taste better than they look. There was also a very pretty sunset this evening as I was coming back across the hayfield. Monday was our 7th wedding anniversary. It was a beautiful, clear, perfect day to be outside. When my husband arrived home he presented me with a flat of bedding annuals that he had carefully picked out and some nice chocolates. I told him, if he wanted to throw on his bee suit and come with me, perhaps I could get him some honey for his present. 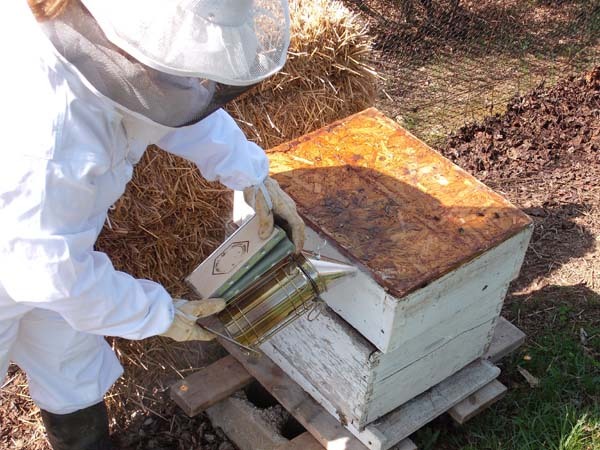 I jumped headlong into beekeeping last fall, when I got word that an older gentleman my mother-in-law knew by acquaintance was going out of the beekeeping business. He was very hesitant to give me any bees at first, because he had in mind to give them to an already experienced beekeeper, which I am not. So in light of that…anything I chronicle on here in regards to my keeping bees is probably not the best way to go about doing things. 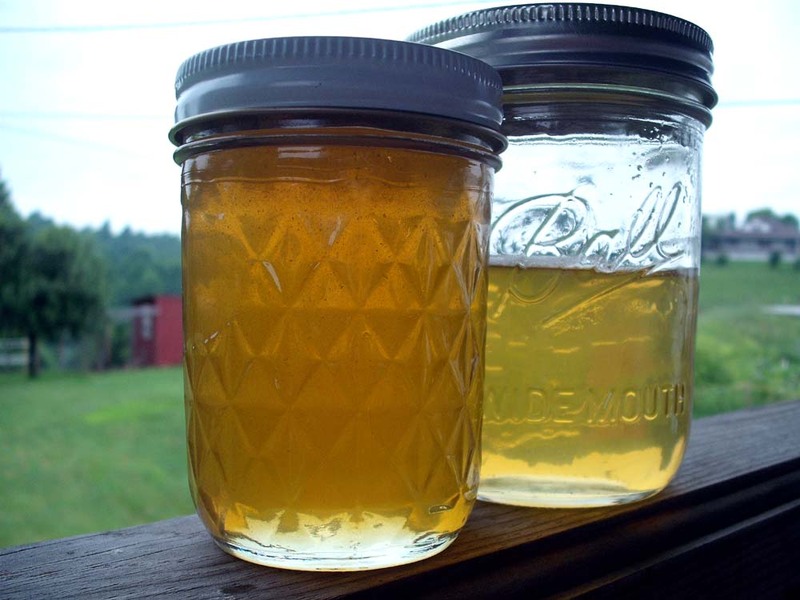 I imagine I will get a good laugh out of it 20 years from now… At any rate, I thought it was particularly memorable and special that I got my very first honey harvest on my wedding anniversary. 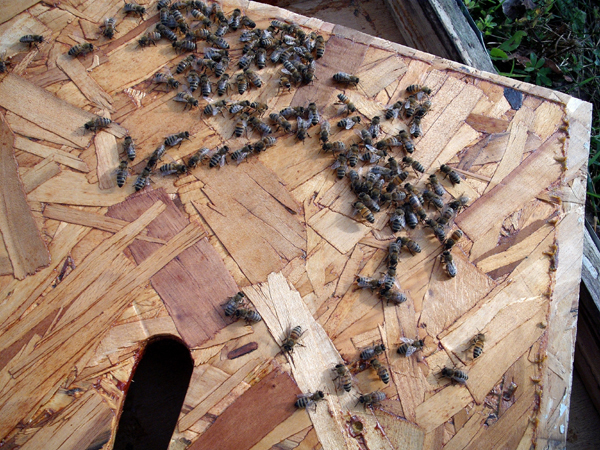 I went down to visit the bees in much nervous apprehension as to what I would find on this second visit, about a month and a half after the mess I made of things on my first visit. I had to put it back together as best I could and hope that all the brood that was still sealed would emerge as they should and be alright. I had to put an extra super around it and just allow the bees to do their thing. 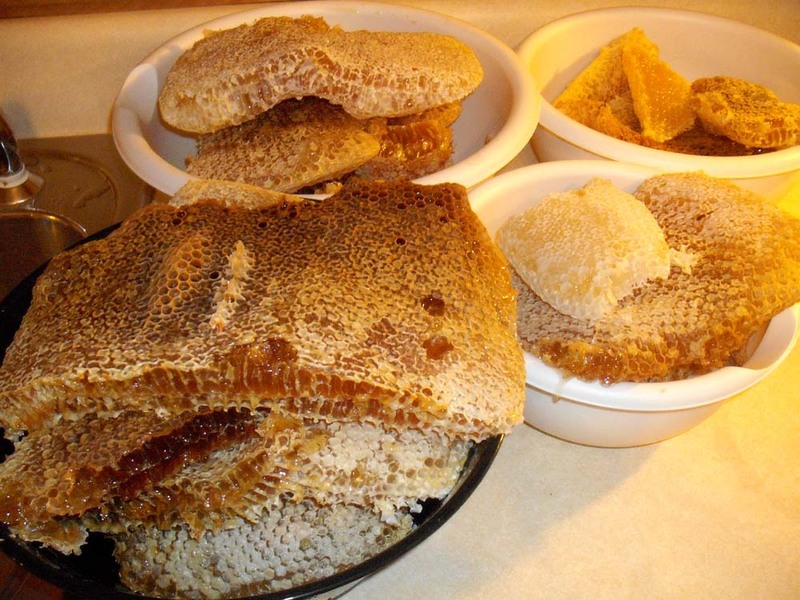 I knew the bees would continue to hang comb from the inner cover, but what they would do after that was an uncertainty. I removed the super and cover together as one piece and finding all the natural comb cleanly attached only to the inner cover, I was then able to take the super off, turn the cover over and deal with the combs individually. 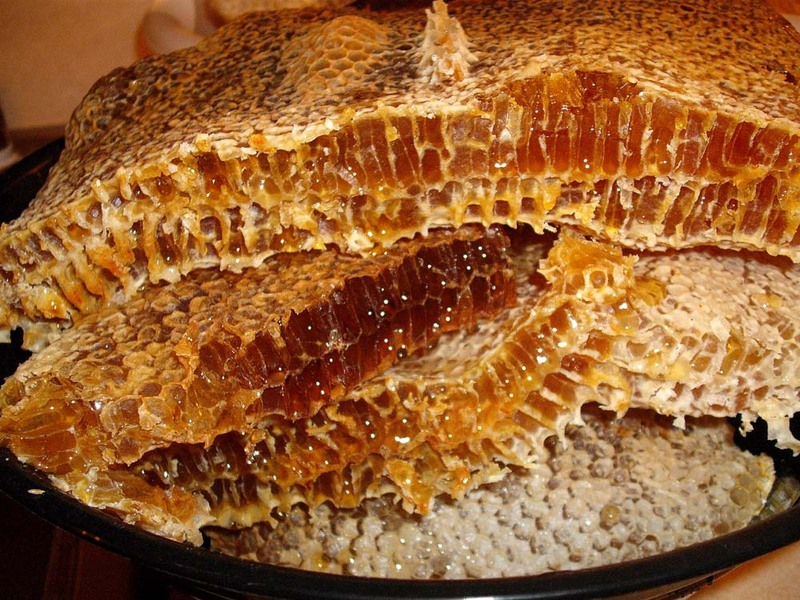 I was presented with the best case scenario I could possibly hope for–they had filled it all with capped honey, ready to harvest! I did have two pieces of the old, previously damaged comb come off, but they were not capped honey anyway. I was going to have to remove all this comb, one way or another at some point. I was so glad the queen had not been laying there. Had that been the case I would have had to very delicately remove each individual comb and attach it carefully to a new top bar, while working quickly and trying not to chill the brood by leaving them out of the hive too long. That really would have been a job! I propped the whole thing against the entrance to the hive and tried to smoke the bees off of it. They did not want to go. So I came back at dusk when most of them had made their way back into the hive and found it much easier to smoke the remaining few bees off of the comb. The darker comb in the center is the old comb that got mangled the first time I opened the box. We took it up to the house and removed the combs one by one and placed them into big bowls. The bees did not come after it because it was dark and that worked out really well for us. They can smell that honey from far away and if they otherwise can, they will find you! It’s amazing how heavy it is. God gave them the design for maximum honey storage and it works perfectly. I weighed the bowls and came out with 26.6 pounds of honey. Those supers are always heavier than they look. Good thing I am strong from lifting my 40 pound toddler. I started working on extracting it last night by crushing and straining it. There appears to be two distinct varietals stored within the combs. 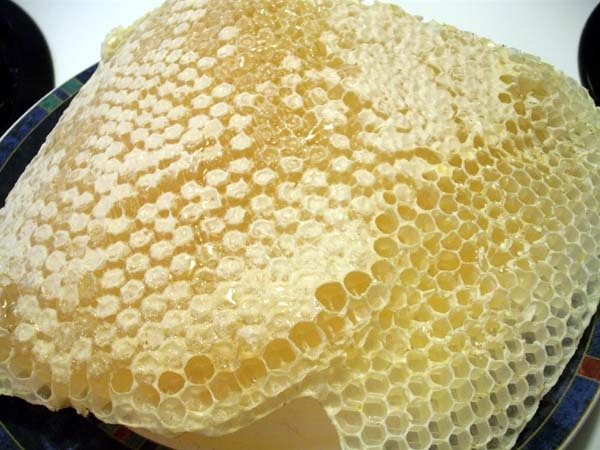 The outermost combs contain a very light yellow, floral tasting honey. 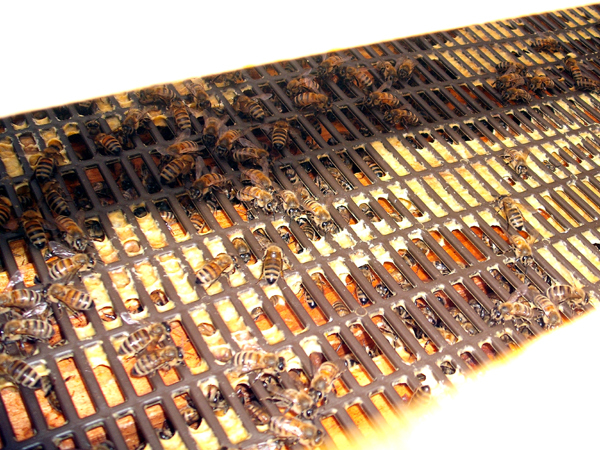 The inner combs had a medium-amber colored honey that was much richer flavored. I came away from this visit to the hive feeling such a rush. I had FUN. Neither of us got stung. These bees must be Italians because they are exceptionally gentle. They paid no attention to us and were only concerned with their honey. It’s really something to stand over a box full of buzzing bees. I think I’m addicted. Life is sweet and I feel truly blessed. I can’t believe it’s been seven years! God’s been good to me and I love the adventures we get to have together as a family. 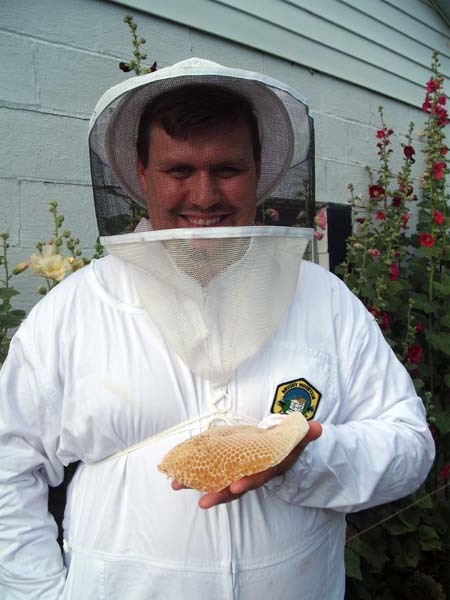 Here’s my honey in his bee suit. 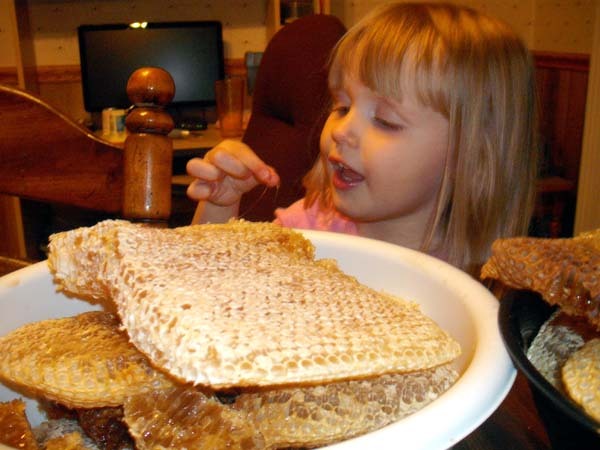 He couldn’t wait to get that veil off and take a bite out of that honeycomb! Yesterday was a beautiful, warm day and one of the least windy we’ve had yet (it’s always windy on our ridge). My cranky and congested toddler was finally down for her nap, so my husband and I hurried to throw on our bee suits, gather up our gear and take our first opportunity to open up the bees. My neighbors stopped their hammering on the shed they were building and came over to check out what on earth we were up to now. They’d never seen anyone in a bee suit before. It is quite a spectacle really. 🙂 After briefly chatting, we headed over the hill to see the bees. With everything bursting into bloom all at once, there has been much activity coming and going from the hive the past week or two. I’ve been eagerly waiting for it to warm up enough so that I could check out what was going on inside the box. It was much like opening Pandora’s Box, because I inherited this entire started hive, knowing that it had been badly neglected and who knew what might be going on inside. This was an escaped swarm and the gentleman I got them from was recovering from a broken hip at the time. 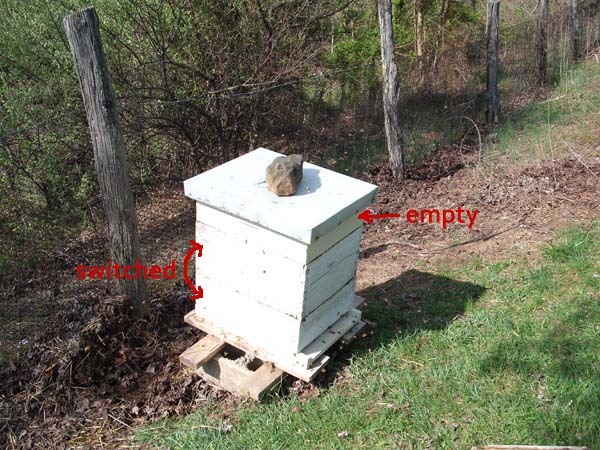 When he saw them going across the street and congregating high up in his neighbor’s tree, he quickly threw together a bait box and set it up on the brushy hillside and the bees did finally decide to take residence. Nothing had been done to them since then (last spring), until I moved them out here last fall. Not an ideal situation really. And me being new to all this, with only two beekeeping books and countless hours of scouring the internet and watching instructional videos on YouTube, who could tell what I was getting myself into? I consider my stubborness to be one of my best qualities! Advisably not the best way to get started in beekeeping, but I am going to try to make this work anyway. I was not quite as nervous as I thought I’d be. Brandon stood by to help when needed and manned the camera for me. Here I have lifted off the telescoping cover and pried loose the inner cover and am sending a couple puffs of smoke beneath it through the crack. I waited a bit, then gently lifted it off. Right off the bat, horror! A section of freeform comb pulled up with the cover. Now I feel sick. The first thing I notice, along with the destruction of large pearly white larvae which have been torn from their capped cells is this solitary swarm cell (queen cell) sticking out like a sore thumb. This means they’re already thinking about swarming again. Soon. I pulled out the outermost frame to see what they were doing with it. It’s about a third full of capped honey. They’re already running out of room. I should have swapped the two boxes sooner. 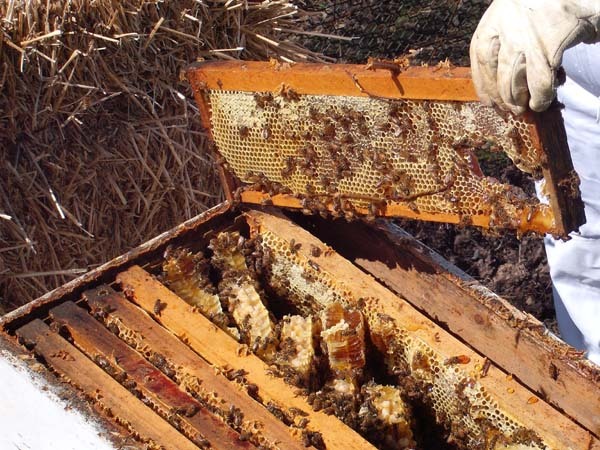 Bees start at the bottom and work their way up. They would have moved up from the deep hive body (larger bottom box) during the winter, to eat the honey stored in the super above. Now the brood nest is in this super, the center of which I just demolished by taking off the inner cover because of the absence of three center frames. They hung their comb from the inner cover instead and it was cross connected to the frames on either side. There was no way to get this apart without making a mess. 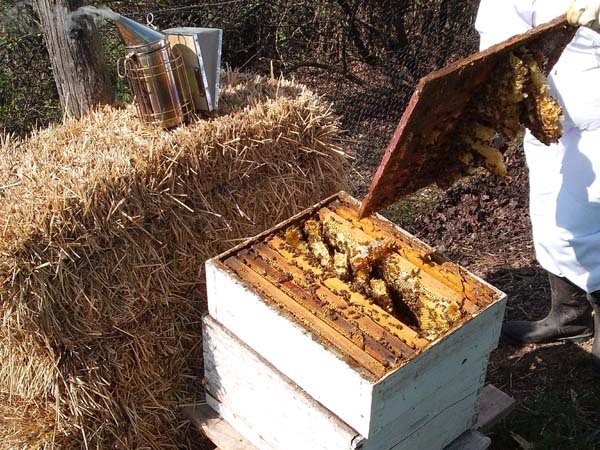 Had I gotten them early enough in the fall, this super would have probably been nothing but honey stores and I could have dealt with this better, removing the damaged comb and giving them a hive top feeder to make up for the loss. Shoulda, coulda, woulda….but this is where I am now, so I gotta come up with a plan. You won’t read about this in the books, because assuming you have gone by the book you won’t find yourself in this mess in the first place. At this point, the bees were still very docile, which really surprised me since I just wrecked their home. I decided I should go ahead and switch the positions of the deep hive body and the super. As I reflect on it now, I think maybe that wasn’t the right decision. Maybe the bees could feel my nerves failing in light of uncertainty as to what to do next. This was when they got really mad. I am happy to report that my bee suit did its job. No stings were received by either of us. I had to lift everything anyways, because one of my main objectives for this visit was to take out the old, mouse-eaten bottom board and replace it with a new IPM (integrated pest management) bottom board. I set the super gently on top of the telescoping cover on the ground and had my husband lift the deep hive body up so I could put the new bottom board underneath. Then I put the super on top of the bottom board. Because I lifted the super (my mistake), I ended up with a pile of damaged freeform comb on top of the hive body. There were almost no bees working in the deep hive body, so it looked to be empty. I am hoping they will move their activity back up into it now that the brood nest is below it. 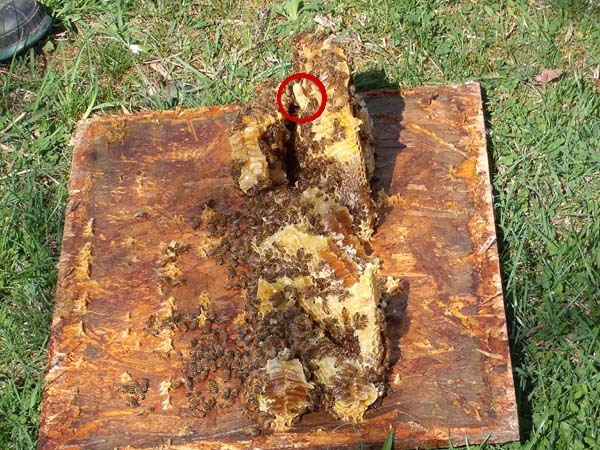 I took an empty super and set it on top of this to encircle the large pile of damaged comb and brood and turned the inner cover so that the hanging comb would be accommodated by the remaining empty space. There was a line of capped brood cells exposed, and they will die, but the majority of them were still capped and will hopefully emerge alright. I feel sorry for the bees that they have to clean up this mess. This photo shows a close-up of the damage to the nest. 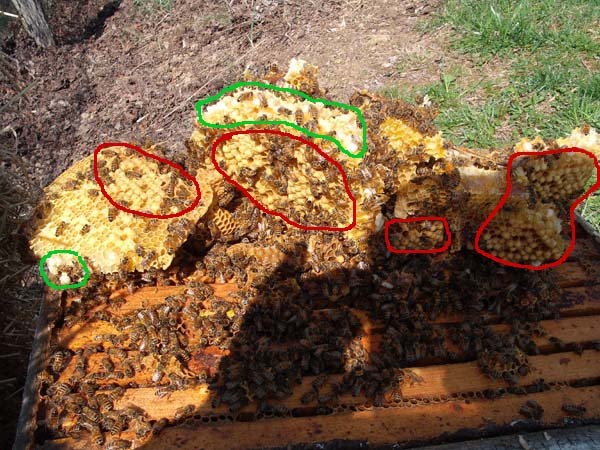 Circled in red are the cells of capped brood. Circled in green is the torn ridge of pearly white larvae exposed. I don’t know where the queen was! I was very careful not to squish anyone. I will be lucky if she was working over in one of the other frames. This frame had no eggs in it, just honey and large capped larvae. She may not be in there at all. I really needed to go through more frames and look for new eggs and wish now that I had. Maybe that is why they are already making swarm cells (or because of the lack of upward room). I could not hang around to do much inspection now that I had really angered them. I felt it was best to get done and close it up for now. So this is what I did get accomplished: I replaced the old bottom board, switched the deep hive body and the super containing the brood nest, added an empty super to enclose the damaged comb, and put the inner cover and telescoping cover back on. I forgot to put an entrance reducer at the opening. I will run down there and do that here in a bit. Update on my bees I got this fall: They are alive and well! We had one of the hardest winters I’ve seen since I was a kid and I really worried that I hadn’t done enough to get them ready for winter, having gotten them so late (October). After every long stretch of bitter cold, I would go down and knock on the box and put my ear to it, listening to the reassuring hum. I went down and sat with them for a bit today (a most gorgeous day it is) and watched to see if they were bringing back any pollen yet. You can actually sit quite close to the hive, off to the side and out of their flight path. They take no notice of you if you’re not waving your arms or banging on their box. No pollen yet, but soon! My curly willows, lilac and the maple trees will be blooming any day now. They were mostly coming out to take their orientation flights, circling 10 feet or so above the hive. Some zipped off over the hill, getting water from the neighbor’s pond I’m sure. No signs of nosema. They seem to be strong in numbers (hard to tell from the still image, but there was much action coming and going from the hive). 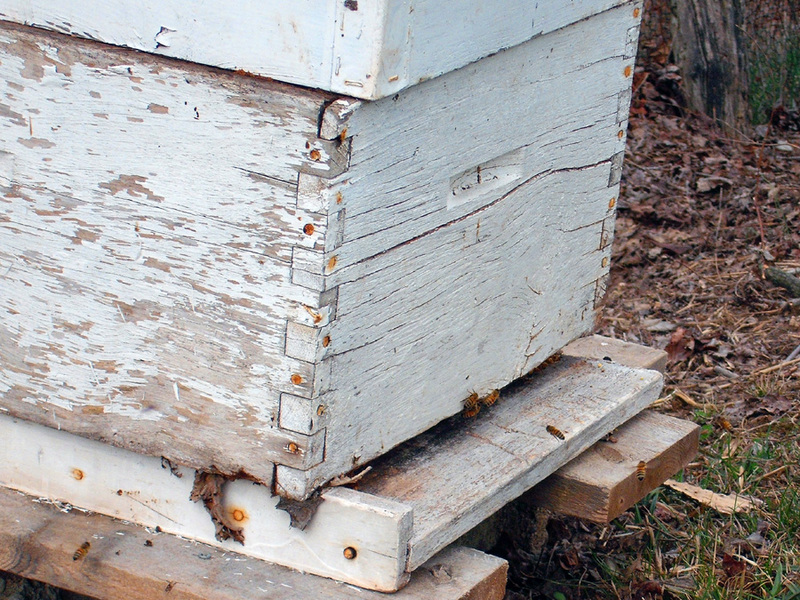 After what I have read this winter, I believe the chewed up old hive body and bottom board were to their benefit, providing good ventilation. Beekeeping for Dummies says that poor ventilation will make them sick quicker than anything. I will be opening them up very soon! It’s so windy today, but warm at least. I’m ready for some bees. I still haven’t gotten my bees home. I will not be able to rest until I do! The UPS tracking number says my gear should arrive today, but I am still looking for them to come. It doesn’t matter anyway. Brandon had a squirrel hunting trip scheduled with a buddy from work, so I can’t get out there today. It’s raining a little too. Surely tomorrow I can get them home. The gentleman who is giving me these bees is very anxious for me to get them home and ready for winter. It has only been a week since he contacted me about it (my initial call was nearly a month ago, and at first he turned me down), so I really can’t help that it is taking awhile for me to get my gear and get out there. Brushy Mountain shipped my gear really quickly too, which is great. I’ve had my site picked out, leveled and set up for several days. I am just as anxious to go get them too. Being my first hands-on experience with bees, I would not have chosen to do it this way if I could have had more control over the circumstances. It is the off season to be doing this and these bees should have been winterized by now. Another downfall in taking on an existing set up is that the hive boxes are old and not in the best shape. He has given me a second piece on everything, including extra supers. I am really going to need them too. I can’t wait to get the hive home and opened up so I can see what’s going on in there. From outward appearances it seems to be a very strong colony. When we lifted the box to set it back upright, it was very heavy. Every bit of 70 lbs or better, so they have themselves stocked up with honey for winter. I am hoping they are healthy and that this will work out for me. After I initially thought I was not going to get any bees from this gentleman, I got online and looked for plans to build my own hive boxes. If you buy everything outright from a catalog, the cost is prohibitive for someone like me. But I have found plans for a top-bar hive that with a little elbow-grease will only run me around $50. I am all for do-it-yourself. I currently have no intentions to sell honey anytime soon, so the reduced output of a top-bar hive is not a deterrent for me. 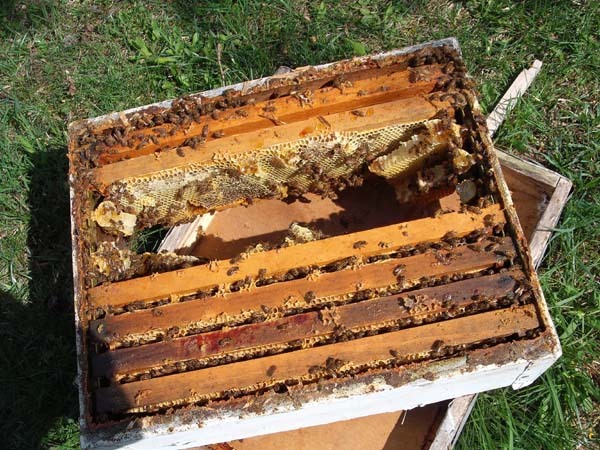 And the ease and sustainability of managing a top-bar hive is definitely a plus. This is truly a new adventure. I cannot rest until I get these bees home and winterized! Yes! Just what I need..another hobby! Ha. It is in motion. It is now a reality. I am getting my first colony of bees. My mother-in-law is always in the right place at the right time and she met an elderly gentleman who is giving up the bee business and he has graciously given me my first start of bees. I got a look at them this evening, but I will have to come back with a smoker and set the hive back on it’s bottom so I can seal it up and transport them. I will update when I get them home.